ArcPad allows for informed discussions with range tenure holders in a time-efficient manner. The operator can carry additional electronic information to calculate rangeland carrying capacity. Summary analysis of range health is easily created. Rangelands in British Columbia (B.C.) are natural landscapes composed of dense coniferous forests, open coniferous forests maintained by fires, dry valley bottoms with bunch grasses, and deciduous forests with mixed prairie and alpine environments. Ranchers and guide/outfitters are allocated use permits (tenures) to graze cattle, horses, sheep, and goats on 11 million hectares of public (Crown) rangelands for four to six months per year. Ranchers interact with other rangeland users, including forestry, recreation, and oil and gas. 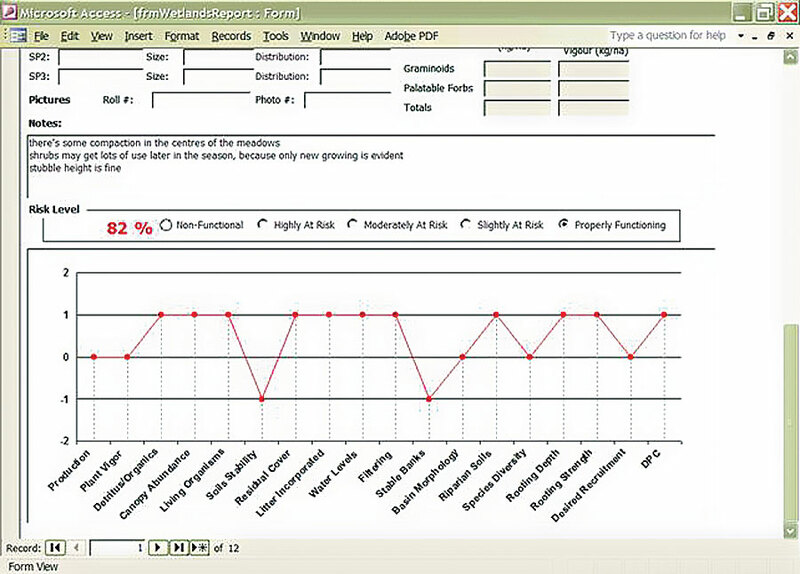 Range health information is collected using ArcPad and digital forms. The data assists resource managers in ensuring that Crown lands provide palatable forage. The evaluation of the impact of range practices on the quality and quantity of livestock grazing is a top-ranked priority under the B.C. Forests and Range Practices Act (FRPA). Multiple use of the diverse and large landscape necessitates systematic organization and collection of ecosystem health spatial data to facilitate monitoring by the Range Branch, Ministry of Forests and Range (MFR), British Columbia, field staff (agrologists). Reliable access to palatable plants on Crown lands supports the beef and guide/outfitters industries in this province. The monitoring and tracking of rangeland health with a handheld computer linked to a GPS enhances field data collection and analysis by agrologists. In the past, range staff collected field data with paper forms. A field day required a large paper map for navigation, clipboards, and water-resistant paper forms to record observations. Staff carried a separate GPS unit to collect spatial data and had to transfer the data to a paper form. Each day spent in the field required three additional days to analyze data and generate reports. Field observations from one week generated a box full of forms, which in turn required nearly a month to analyze and summarize. Range staff adoption of digital technologies has notably reduced the time taken to collect data, complete analysis, and write reports. Field data collection involves recording how extensive grazing is; measuring bare soil, plant vigor, and community structure; identifying the location of range improvements; detailing the extent of weeds; determining how many animals a particular pasture will support; navigating in the field; linking digital pictures with the appropriate inspection form; and recording additional written and audio notes. Range staff report that the conversion to electronic data collection reduces analysis and summary time by at least 75 percent. Unanticipated benefits of the new technology include improved navigation and a visual summary of the extent of a monitoring regime, both of which improve the cost-effectiveness of subsequent field trips. Adopting this new technology is an important step in improving the understanding of rangeland health at a provincial level and provides data at a finer scale than in available digital layers. Summary analysis from field data indicates the degree of risk to range health. The staff's model of electronic data collection requires a personal digital assistant (PDA), GPS, and ArcPad mapping software to support data collection. B.C. government agencies are established users of Esri's GIS software. Users navigate, orient themselves, and collect data by referencing base layers downloaded from a central data repository (the B.C. government's Land and Resource Data Warehouse) and displayed on their PDAs. Available information includes five-meter resolution satellite imagery; contour lines; a vegetation layer; and a blended biological, geological, and climatic layer. Data recorded in the field is output in the form of shapefiles and thus is directly compatible with the ArcGIS Desktop (ArcView, ArcEditor, and ArcInfo) software used by the MFR geomatics specialists. HP iPAQs have been used as primary PDAs by the Range Branch for more than two years because they are inexpensive and lightweight, have a clear screen, and provide a suitable processor speed for required tasks. Effective electronic data collection requires an operator with knowledge of the ecosystem, PDA and GPS functions, and appropriate protective cases. A compact flash or secure digital memory card of at least one gigabyte is necessary to store base imagery, shapefiles, and inspection forms. Operators may find a telescopic pole useful to elevate the GPS. Users can increase field time by carrying a spare battery or mobile battery or charging the PDA and GPS in the truck between inspections. Operating time with an extended battery is six to seven hours. Most basic PDAs will have the necessary processing speed and radio receiver to operate the ArcPad software and link with a GPS. Total cost for equipment and software is between $1,500 and $2,500 per unit. The processing power of the PDA allows the operator to carry additional electronic information from each rancher or a spreadsheet to calculate rangeland carrying capacity and thereby enables field staff to conduct partial analysis while in the field. This process supports decision making and allows for informed discussions with range tenure holders in a time-efficient manner. Collecting data with a handheld computer allows for consistent collection of information in the form of a permanent legible electronic file that is easy to store and sort. The Rangeland Health Forms were created in partnership with Coastal Resource Mapping (CRM) Limited (Nanaimo, British Columbia). CRM generated electronic forms using ArcPad Application Builder, and data is stored in a Microsoft Access database. Summary analysis of range health is easily created through functions built into Access. B.C. 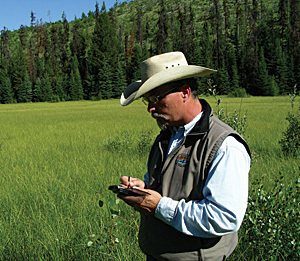 Forest Service agrologist Rob Dinwitty completes a rangeland health inspection form using mobile GIS and a handheld computer in the middle of a sedge meadow in B.C. 's Okanagan. Range staff have created a guide to system operation because users are located in different areas of the province. The guide addresses topics including using ArcPad with electronic forms, acquiring and using underlying spatial data, and addressing PDA challenges. New users are most successful when they recognize the benefits of the technology and are eager to adopt it. For example, range officer Karen Tabe says that "using the technology boosts my navigation abilities, making me feel more confident when spending time in the field." In the future, range staff will be required to perform more mapping work with faster PDAs capable of performing more tasks and processing higher-resolution imagery. Plans to refine the approach include implementing Microsoft SQL Server. This will enable range data to be uploaded over the Web from various forest districts to the Range Branch's centralized server. 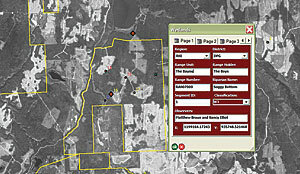 Field staff will maintain editing ownership over the data they collect, but central access will enable branch-level staff to view the data to conduct trend analysis at provincial-level scale, communicate problem areas to specialists, identify potential areas for restoration work, and locate areas for site exclosure monitoring. In addition, communication of the specific location and spread of invasive plants can occur more quickly. Parsing out data from SQL Server into XML will enable upload of range health data into B.C. 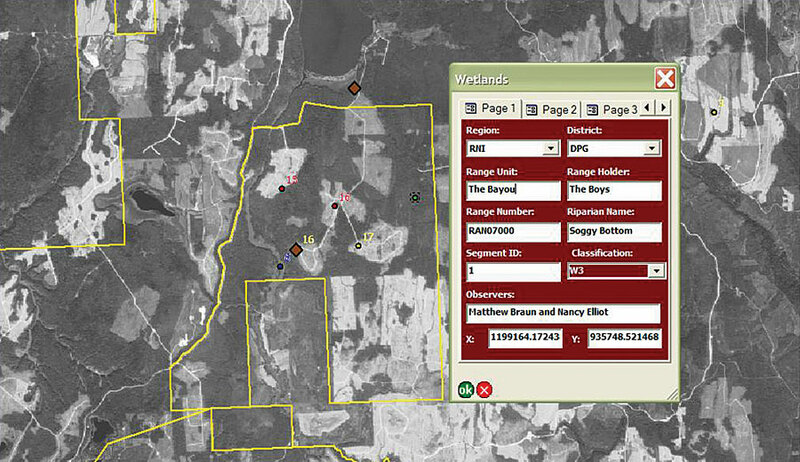 's Forest and Range Evaluation Program (FREP) database. The flexibility of changing technology ensures that the Range Branch can provide FREP with monitoring data required under FRPA, as well as empower range staff to collect and analyze other significant information. Matthew Braun and Andrew Pantel are mountain pine beetle range agrologists in Range Branch, the Ministry of Forests and Range, British Columbia. Nancy Elliot is a GIS operator in the Range Branch. For more information, contact Matthew Braun (e-mail: Matthew.Braun@gov.bc.ca) or Nancy Elliot (e-mail: Nancy.Elliot@gov.bc.ca), British Columbia Ministry of Forests and Range, or John Ziemanski, president (e-mail: john@crmltd.ca), or Scott Dwyer, programmer and spatial analyst (e-mail: scott@crmltd.ca), Coastal Resource Mapping.